Counter-terror expert says Lebanese branch of terror group that claimed responsibility for Iran embassy bombing was established by Iran. The Lebanese branch of Abdullah Azzam Brigades, the Al-Qaeda-linked terrorist group which claimed responsibility for Tuesday's attack on Iran's embassy in Beirut was initially established by Iran, according to a Middle East counter-terror expert. 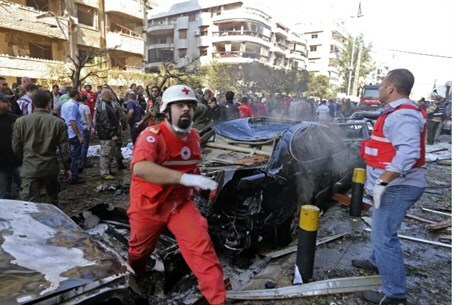 Tuesday's attack in Lebanon left 23 dead, among them an Iranian attaché, and an additional 146 wounded. The blast reportedly was a message telling Iran and its Lebanese proxy Hezbollah to pull their forces out of Syria where they are supporting President Bashar Assad's regime. Al-Qaeda sides with the rebel forces. Mustafa Alani, senior adviser and program director in security and terrorism studies at the Gulf Research Center, told Al Arabiya that the Lebanese branch, named the Ziad al-Jarrah Battalion, was formed by Iranian intelligence services in 2003. Alani's revelation contrasts with Hezbollah's accusations that a "Western-Israel alliance" was behind the embassy attack. The Ziad al-Jarrah Battalion is named after a Lebanese terrorist behind one of the September 11 attacks on the US. Having been active since 2003, the terrorist organization was incorporated into the Abdallah Azzam Brigades when it was formed in 2009. The head of Abdallah Azzam Brigades, Majid bin Muhammad al-Majid, previously worked with a Lebanese based terror group Osbat al-Ansar.